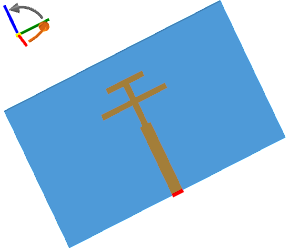 This antenna is a variation of a basic planar monopole antenna with the shape consisting of two overlapping T's that connects to a common base. An additional section is attached to excite a second resonance at a higher frequency. As with several other planar antennas, this monopole can be integrated on the same substrate as other electronics. The T-shape monopole makes the antenna more compact than a straight monopole. 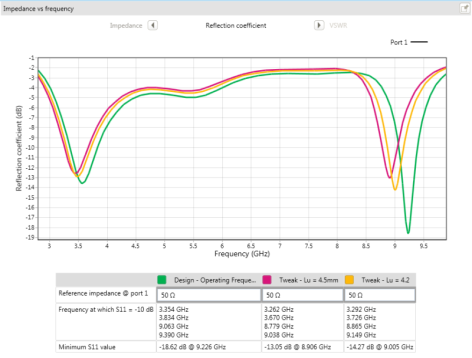 In this application note we discuss the design methods available in Antenna Magus for the Printed Dual-Band Double-T Monopole Antenna. We also discuss the 'Substrate Library' and its use with regards to the current template. To start the design process we have to locate the antenna template that we will work with. Ensure that Antenna Magus is in 'Find' mode so that the Antenna Database is visible in the workspace and type "Double-T" into the search bar to search the desired antenna. When searching the Antenna Database the antennas are grouped according to the keywords, with the most relevant antennas on top. When searching for "Double-T " the antenna we require, printed dual-band double-t monopole antenna, is in the top group. Add this antenna to the user collection by double-clicking or clicking the 'Add' button that is visible while hovering over the template icon. Also add this antenna to the info browser by clicking the 'Info' button that is also displayed while hovering over the template. The Info Browser (shown below) displays additional information on the antenna and can be used to compare it with other antennas. After inspecting the additional information, close the information browser or switch back to the main Antenna Magus window. The Printed Dual-Band Double-T Monopole template offers three design methods. The first method allows for the specification of only the two operating frequencies; The second methods allows for the specification of operating frequencies as well as specifying the substrate to be used; The third method is to design a dual-band for the popular WLAN (IEEE802.11) standard. We will discuss the first two of these methods. This design method designs a Printed dual-band double-t monopole Antenna by specifying the two operating frequencies. 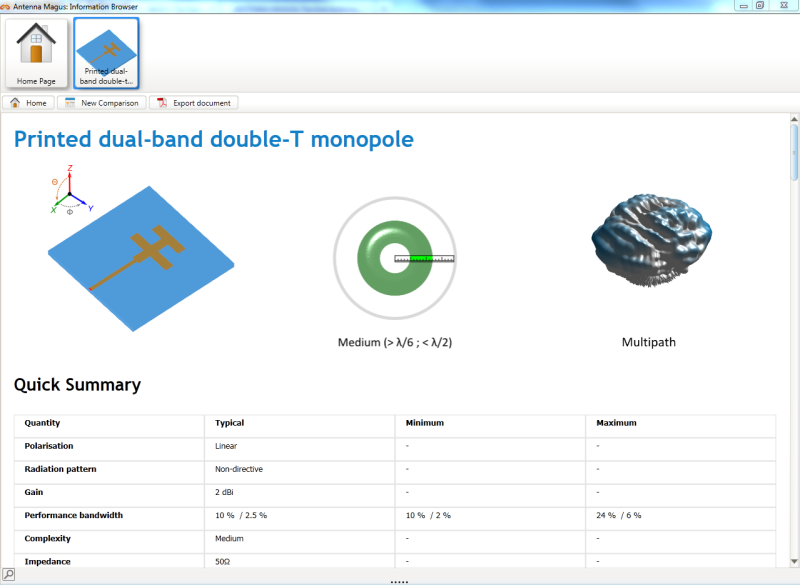 Start by selecting the Printed dual-band double-t monopole prototype from the user collection. A new design should be started automatically. A new design can also be started by clicking the on the 'New Design' button in the 'Home' ribbon when a prototype is already open. In the 'Design Objectives' expander located in the pallet, select 'Operating frequencies' as the 'Design for:' option. Set the two operating frequencies to 3.5 GHz and 9 GHz respectively. And click on 'Design'. This will design the antenna with the specified frequencies as the design objective. The parameters designed can be viewed in the 'Parameters' expander located in the palette, note how these parameters correlate to the sketch parameters shown in the workspace. A preview of the model is also generated and displayed in the workspace. 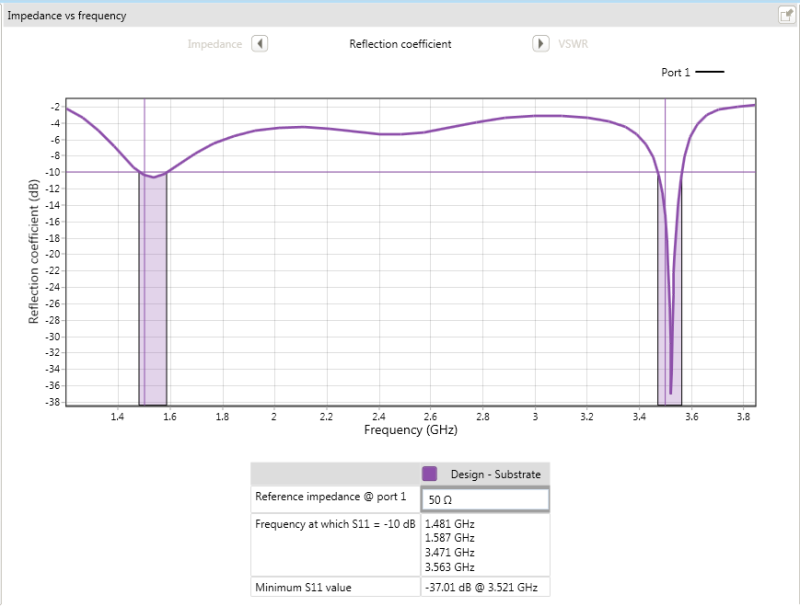 To simulate the antenna, click on the 'Estimate Performance button' located at the bottom of the 'Parameters expander'. Once the estimation has completed, navigate to the 'Estimated performance' tab to view the results (shown below). From the reflection coefficient plot we notice that the minimums do not correlate exactly with the desired frequencies. The second minimum is at 9.2 GHz, which is slightly too high. The upper frequency can be reduced by increasing the length of the upper T's monopole. We have to tweak the design until the desired results are obtained. Click on the 'New Tweak' at the bottom of the parameters expander. We are now able to tweak the parameters and compare the results to the original design. Switch to the 'Sketches and Design Guidelines' tab and view the antenna sketches. We note that the length of the upper monopole is determined by the Lu1 and Lu2 parameters. In the 'Parameters' expander, set the values for Lu1 and Lu2 to 4.5mm and click on 'Estimate Performance' to view the effect of the tweak. 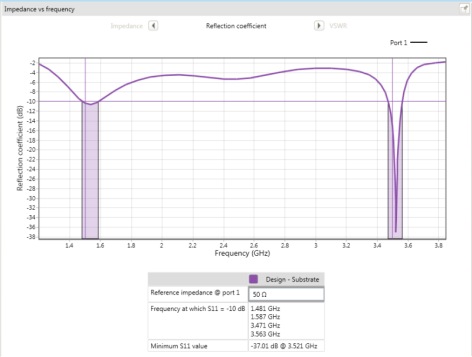 From the results (shown below), we see that the minimum S11 is now below the desired frequency at 8.9 GHz. The length of the monopole has to be decreased slightly. Start a new tweak and repeat the process with Lu1 and Lu2 set to 4.2 mm. Shown below is the reflection coefficient of the original design and the two tweaks. We note that the second tweak yields the desired results with the minimums at the correct locations (3.5 GHz and 9 GHz). The antenna template also offers the ability to design for a specific substrate. Start a new design by clicking the 'New Design' button in the 'Home' ribbon or in the 'Design Objectives' expander. Select 'substrate' from the 'Design for:' dropdown located in the 'Design Objectives' expander. Now we have the ability to specify the desired operating frequencies as well as the substrate that will be used. Ensure that the operating frequencies are set to 1.5 GHz and 3.5 GHz respectively. The next step is to select the substrate. Click on the magnifier button in the 'substrate' section. This opens a list of recently used substrates. Below the list is a 'Open Library...' button, click on it to open the substrate library. The substrate library shows an extensive list of commercially available substrates. Here we can browse the substrates or search for a substrate with specific properties. In the 'Filter by:' expander select 'Arlon' as manufacturer and set relative permittivity to 2.5 with a 5% deviation. This will filter the library for substrates that meet the criteria. In the 'All Substrates' windows there are two substrates that match our filter criteria. Double click on the top substrate to add it to the 'Substrate Shortlist'. Ensure that the 'AD PIM 250' substrate is selected in the short list and click the 'Use Substrate' button in the 'Substrate Library' ribbon. The selected substrate is now displayed as one of the design objectives. Click on the 'Design' button to design our antenna for these objectives. The designed parameters are now displayed in the 'Parameters' expander. 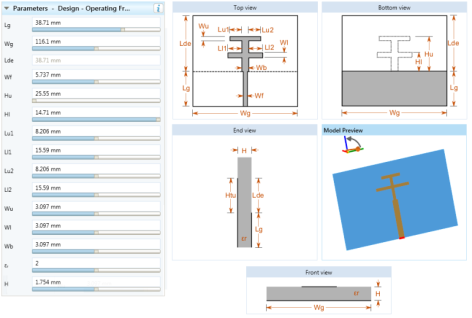 Inspect these parameters and note how they correlate with the sketches in the workspace. We simulate this model by clicking the 'Estimate Performance' button at the bottom of the 'Parameters' expander or on the 'Home' ribbon. Navigate tot the 'Estimated Performance' tab once the simulation has completed to view the results. Shown below is the Reflection coefficient of the design. This application note discussed the process of designing the Printed Dual-Band Double-T Monopole Antenna from its templates. 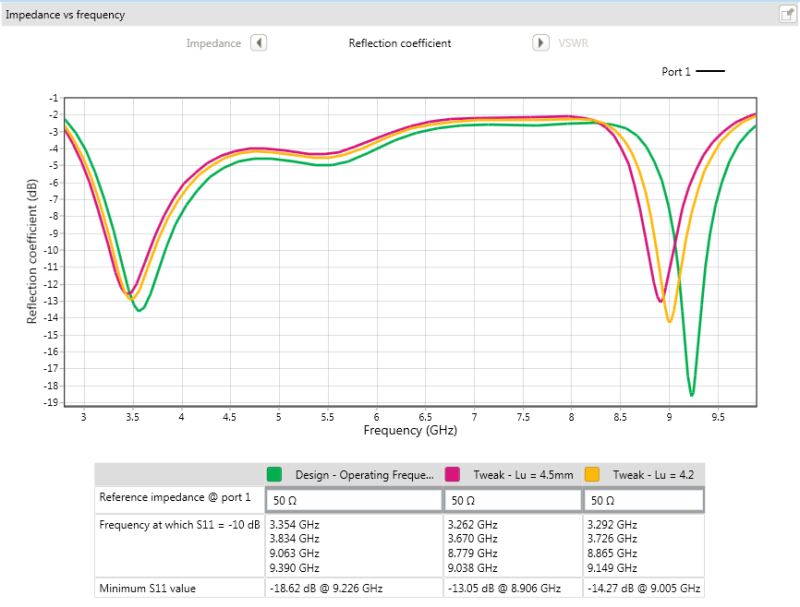 We demonstrated the change in the frequency response of the antenna when tweaking the physical design. We note that this tweaking is required at times to achieve optimal performance. Lastly the use of the 'Substrate Library', where the user can select a substrate by either specifying the manufacturer or desired properties, was demonstrated.